Recommended to: Fans of the series, although this can be read as a standalone as well. One night, New York FBI agent Aiden Mahoney receives a visitor in a dream—an old friend named Richard Highsmith. The very next day he's sent to Sleepy Hollow because Richard's gone missing there. Maureen—Mo—Deauville now lives in the historic town and works with her dog, Rollo, to search for missing people. She's actually the one to find Richard…or more precisely his head, stuck on a statue of the legendary Headless Horseman. Mo and Aiden, a new member of the Krewe of Hunters, the FBI's unit of paranormal investigators, explore both past and present events to figure out who betrayed Richard, who killed him and now wants to kill them, too. As they work together, they discover that they share an unusual trait—the ability to communicate with the dead. They also share an attraction that's as intense as it is unexpected…if they live long enough to enjoy it! So, I actually went into The Betrayed knowing that this is a well established series, and that I'd be coming in on the most recent book. There are 13 books in the Krewe of Hunters series that come before this one, but I was told that I'd have no problem reading it as a standalone. I have to say, that was accurate! I may have been missing a bit of the history of the Krewe, but these characters and their story line stood firmly on their own. If you're thinking of picking this up, and worried that you might be lost, never fear. It truly can be read separate from the rest. On to the review, shall we? In all fairness, I don't read a lot of romantic suspense. 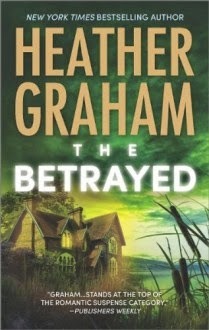 However Heather Graham has been hailed as a master of the genre, so I wasn't afraid to pick up one of her books. I've been told that Graham loves her settings, and I now know that to be the truth. This particular book is set in Sleepy Hollow and the surrounding area. Places rich with history and old tales. I was completely impressed at how vivid everything about this setting was. The places become characters in their own right, adding just the right amount of tension to the story. I've never been to these places, but after reading this book I might just have to make a trip and soak up the atmosphere. The problem was that, although the setting was beautifully done, the characters just didn't catch my attention. I didn't mind Mo or Aiden. They weren't obnoxious, or over the top. Unfortunately, that was exactly what I couldn't latch onto. These characters felt flat. Like paper cutouts of human beings. There wasn't anything wrong with them at all but, because of that, there was nothing attractive about them urging me to care to them. Adding to this, was the fact that the dialogue between all the characters in this book felt very awkward and disjointed. Their interactions were just so uncomfortable for me to read. It made getting through this book take a lot longer than I expected. At the end of the story, I just felt unfulfilled. As I said, the setting of this book is gorgeous. Perfectly rendered, and definitely with a charm all its own. The mystery aspect isn't half bad either. I liked the twists, and turns. If it weren't for the wooden characters, and disjointed dialogue, I really think I would have enjoyed this story immensely. I've been assured by other readers of this series that the books prior to this are much better. So this might just be a case of a rocky book in the mix. I liked what I read enough to be interested in continuing, at least.